Fred Fujio Shimasaki has been with Eden Japanese Senior Center for about 20 years. Fred is an enthusiastic member who helps organize the annual flu shot drive, suggests speakers to give presentations to the group, and volunteers to pick up neighborhood newspapers to share with others at meetings. He faithfully volunteered once a week at a free health clinic in San Leandro as a pharmacist. With his late-wife Ellen, Fred helped the San Leandro Library with their video documentation of the WWII incarceration experiences of Japanese Americans. He attended UC Berkeley on the GI Bill and after finishing pharmacy school served in the Korean War as a combat medic. Toshiye (Tamura) Hasegawa has been involved with Eden Japanese Senior Center for 45 years. She is known and most comfortable as a “behind the scenes” volunteer whose strongest attribute is taking initiative. Until she turned 88 years old, she coordinated the lunch service, assisted with activities, and would bring her favorite treats for the group, such as peanut butter mochi and sekihan. Toshiye also volunteers for the Eden JACL, the Eden annual bazaar, and Appreciation BBQ. The delicious “Toshi’s teriyaki sauce” makes an appearance at such events and various fundraisers. As part of Ashland Howakai, she has coordinated monthly potlucks following services at Oakland Buddhist Church. 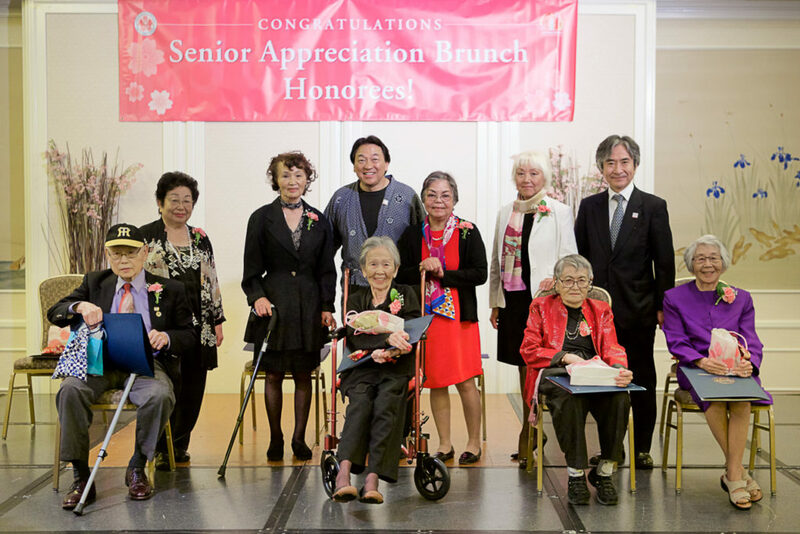 Grace Kase has been a strong supporter of Japantown and became involved with the NCCBF in 2013 as a sponsor for the Senior Brunch. Grace is also involved with the JCCCNC and established the Kase Nikkei Community Scholarship Program in 2012. The $5,000 educational scholarship is a ten-week community and career development opportunity for youths pursuing college education and is designed to increase their understanding of contemporary social, cultural, civic, and preservation issues affecting the Japanese American community. Grace believes that supporting the leadership development of Japanese American youth is vital to the future of our community and preserving its rich history, heritage, and traditions for generations to come. Shirley Toshi Kuramoto’s association with Yu-Ai Kai began when she brought her mother, her 102 year-old sister-in-law, and an aunt to the Senior Day Services program. Shirley began helping with the Friday senior newspaper rolling activity and serving lunches with her husband Sam at the nutrition program. For the past eight years, she has been the resident playwright, producing seven plays for the seniors to enjoy. Shirley is a docent at the San Jose Japanese American Museum as well as the San Jose History Museum, and is an original member of San Jose’s Senior Taiko Group. She considers herself a lifetime learner and received her B.A. degree at 43 years young. Her dream is to join the Peace Corp. Native San Franciscan Leona Nakagawa joined Kimochi, Inc. in 1985 and is one of the center’s most popular instructors. She started their ceramics class with her father, Roy Abbey, and has continued the class for 32 years. She currently teaches with Angie Chan twice a week. She is extremely talented and has a gift for encouraging and teaching seniors to produce beautiful ceramic pieces. These creations are sold at fundraiser events with all the proceeds benefiting Kimochi services. The Abbey and Nakagawa family have carried on this tradition of volunteerism for four generations with Leona’s children and grandchildren helping at various events. Satoko Tyrus joined and has been an active member and volunteer at the Sakura Kai Senior Center for 30 years. She is recognized as a diligent, conscientious volunteer and leader. Satoko serves as the unofficial volunteer librarian who has the challenging task of collecting, organizing, cataloguing, stacking, and maintaining the books and movies for Sakura Kai. The library is a huge asset and is a very popular stop for many members for its rich Japanese material. Satoko also volunteers as a Conversational Japanese teacher, translator, and interpreter. She is always willing to assist individuals learn more Japanese so they can better communicate with members, families, and friends. Virginia Tanakatsubo first came to help with JACL activities at the San Mateo Japanese American Community Center (SMJACC) in 1984. She soon became the Volunteer Coordinator, and the Executive Director from 2007 to 2014. Virginia helped develop programs for the community until her retirement. Her dedication and devotion to the Center continues as a key volunteer who helps as desk receptionist, a driver for the seniors, and the head cook for the senior men’s club. She also coordinates the Tomodachi senior women’s club and volunteers at the San Mateo Public Library in their adult literacy program, Project Read. One of Virginia’s most significant contributions is her work to help war brides with their needs after their husbands passed away. June Pramualphol began her association with Kokoro Assisted Living in 2003 when she was a caregiver for seniors at the facility. She retired as a caregiver in 2016 but has continued as a volunteer supporting Kokoro in many wonderful ways. June is exceptionally compassionate and gifted with great levels of natural empathy. Seniors respect and trust her with their care and enjoy the activities she leads. She instructs the Japanese Calligraphy and cooking classes, helps with hair and manicure activities as a Licensed Cosmetologist, leads mind-stimulating games, supports the Garden Club, and escorts the seniors for off-site trips.